Solar Montgolfieres are lightweight balloons that could be used for controlled, low velocity impacts of Martian payloads or for exciting imaging and science balloon missions at Mars, as well as at Jupiter and Saturn. These balloons have an open bottom and would be filled with ambient atmosphere as they fall when deployed during atmospheric entry. They wouild be quickly heated by the sun and can provide partial buoyancy to soft-land payloads. After dropping off the payload, the balloon could then re-ascend with a 1-kg gondola that performs imaging and science for the remainder of the day. The required balloon mass to float a 50 kg gondola at Mars is only about 47 kg, and this same Montgolfiere could be used as a parachute to soft-land a 420 kg payload on Mars at 15 m/sec vertical impact speed. Montgolfieres have a big advantage in that numerous small leaks do not impair performance, since leaking air is quickly replaced and re-heated by the sun. These "Montgolfiere" balloons are named after the two 18th-century French brothers Joseph-Michel and Jacques-Etienne Montgolfier, who were the first to fly hot-air balloons. Solar-heated balloons are nothing new. In fact, they are commercially available as novelty items and have been banned in some countries due to interference with commercial aviation. Since the 1970's, the French have flown over forty Montgolfieres in the Earth's stratosphere (10 mbar - 40 mbar). The longest flight lasted 69 days and encircled the Earth twice. All Montgolfiere testing to date, prior to this JPL effort, has involved balloons that are gently launched from the ground, using either hot air or helium to provide initial buoyancy. The present JPL test effort, which was begun in 1997, has concentrated on deploying Montgolfieres from the air, as would be done on a mission to Mars. Military Montgolfieres and non-heated Montgolfieres, which are actually parachute balloons (a.k.a. "paraballoons") have also flown frequently, and have been used extensively by the U.S. Air Force as pilot ejection seat decelerators and to slowly descend bombs or bright observation lights during low altitude bombing runs. The testing being conducted by JPL attempts to combine the high-strength deployment requirements of paraballoons with the lightweight, cold strength requirements of stratospheric Montgolfiere balloons. JPL has recently found altitude control systems that allow precise altitude control. 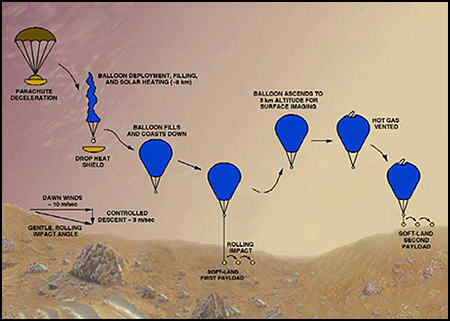 The novel systems would allow balloons to collect and examine multiple ground samples over long distances for periods up to 90 days if deployed at a Martian pole in the summer. They also would allow very long-life balloons on Jupiter and Saturn that can dip into the lower water/ammonia clouds and survive the nights (~5 hours) by climbing very high before sunset.